The Winder Plus commercial bike rack has a common, easily recognizable bike rack presence. This rhythmical commercial grade bike rack features a 36" height which makes for easier loading from one or both sides. The Winder Plus bike rack is made of sturdy 1-5/8" O.D. 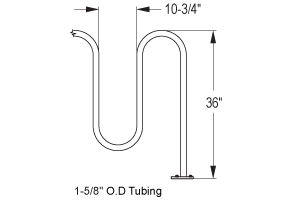 structural steel tubing (1-1/4" Schedule 40 pipe) and is well prepared for any weather. 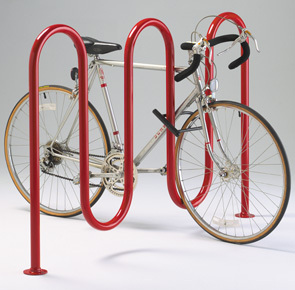 It allows the use of high security U-locks to secure the frame of the bike to the rack. The Winder Plus has the capacity to park up to 11 bikes and is available in a Galvanized, Powder coat or Stainless Steel finish. 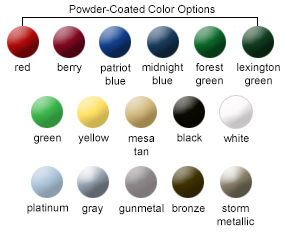 Mounting options include In-ground and Surface mounting. Drop In Anchors available for concrete installation.